Oh my goodness!!! 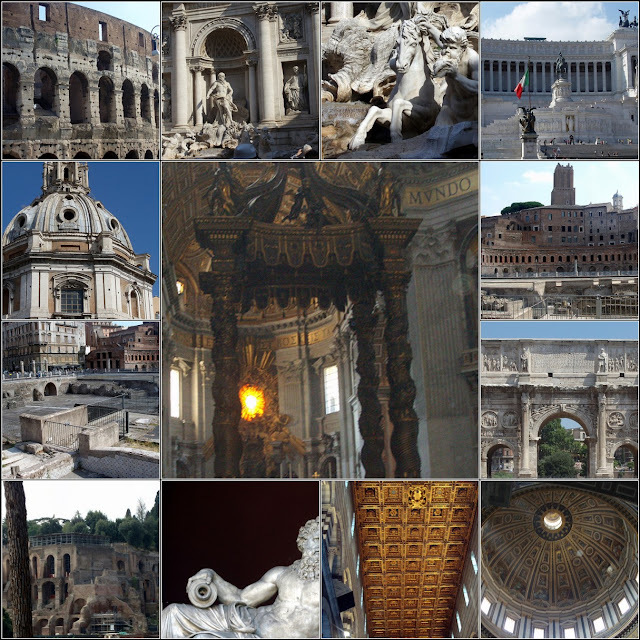 The beautiful Eternal City of Rome and Vatican Museums. On August 4, 2010, the ship docked in Civitavecchia a busy commercial port for the region. And, at 7:00 a. m. we departed on the most amazing tour I have ever experienced. A motor coach drove our group into the heart of Rome, passing St. Paul's Basilica, the Pyramid of Caius Cestius, Circus Maximus and stopping at the Trevi Fountain to toss in a coin to ensure our return to Rome someday. We walked to Piazza Venezia (Venice Square), along Imperial Forum Avenue and then stopped for a view of the Roman Forum. On the far side we saw the Colosseum and the Arch of Constantine. After lunch we crossed the River Tiber to the Vatican State and stepped through the embrace of Bernini's spectacular colonnades to the vast expanse of St. Peter's Square. As we entered Christendom's largest church - St. Peter's Basilica we realized its enormity. We looked at the metal markers on the floor inside showing the comparative lengths of other churches and cathedrals. Suspended over the altar, where the Pope celebrates mass, is the gilded papal canopy, called Baldacchino, created by Bernini in the 17th century. After visiting St. Peter's Basilica, we explored the richest storehouse of art in the world.. The magnificent Vatican Museums, included the Pine Cone Courtyard, the Belvedere Courtyard with its famous statues, the Candelabra Gallery, the Tapestry and Geographical Map Galleries, and finally, the glorious Sistine Chapel which holds an invaluable collection of masterpieces including Genesis and The Last Judgment by Michelangelo. We walked approximately two miles over uneven surfaces with extended periods of standing and about 50 steps. Audio headsets were used to enhance our tour experience. What a perfect day. The weather was wonderful. We had a delicious lunch in a very comfortable restaurant and the trip back to the ship was about a two hour drive in an air conditioned coach which was very nice after a long day walking ROME. I hope you have enjoyed your visit to My Cozy Corner today. I enjoyed sharing the experience with you. If you want to visit the Vatican Museums and the Sistine Chapel for free on September 27 it'll be free entrance. Thank you for sharing your fabulous vacation with us ,Betty.. I'm sure you made some wonderful memories there..
Wow-since I'll never get to go-really enjoyed the pics! Beautiful! My parents have been several times and I hope to go someday. Great mosaic! Looks and sounds like you had a fantastic time! Thank you for sharing your trip to the beautiful Eternal City of Rome and Vatican Museums! Betty, my husband and I are traveling to Italy in September so I am thrilled to read your posts three years after you wrote them. I am getting more excited by the minute. Thank you for valuable information to enhance our trip.